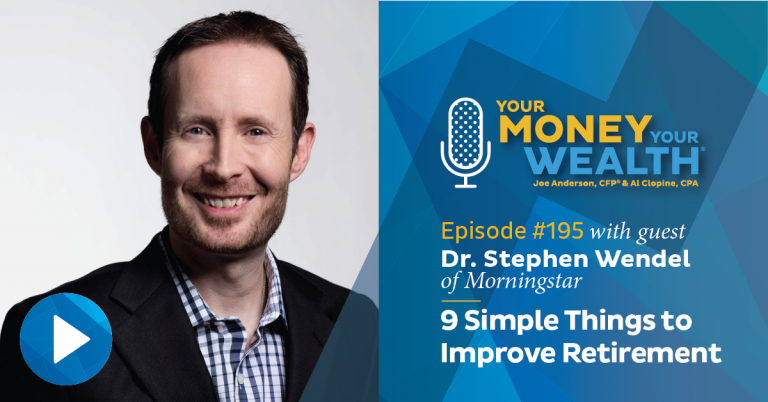 Do These 9 Simple Things to Improve Your Retirement | Pure Financial Advisors, Inc.
Dr. Stephen Wendel, Head of Behavioral Science at Morningstar, talks about the challenges that keep us from making good investing decisions, and 9 simple actions we can take to create a better retirement for ourselves. Plus, a quick look at how companies helped get out the vote for the midterm elections and some market movers and shakers. And of course, answers to your money questions: Can you contribute the max to both a Roth and a traditional IRA, then do a conversion in the same year? If you roll a 401(k) with after-tax assets to a Roth, will the pro-rata tax rule apply? And if you’re living comfortably within your means in retirement, is it wise to invest? 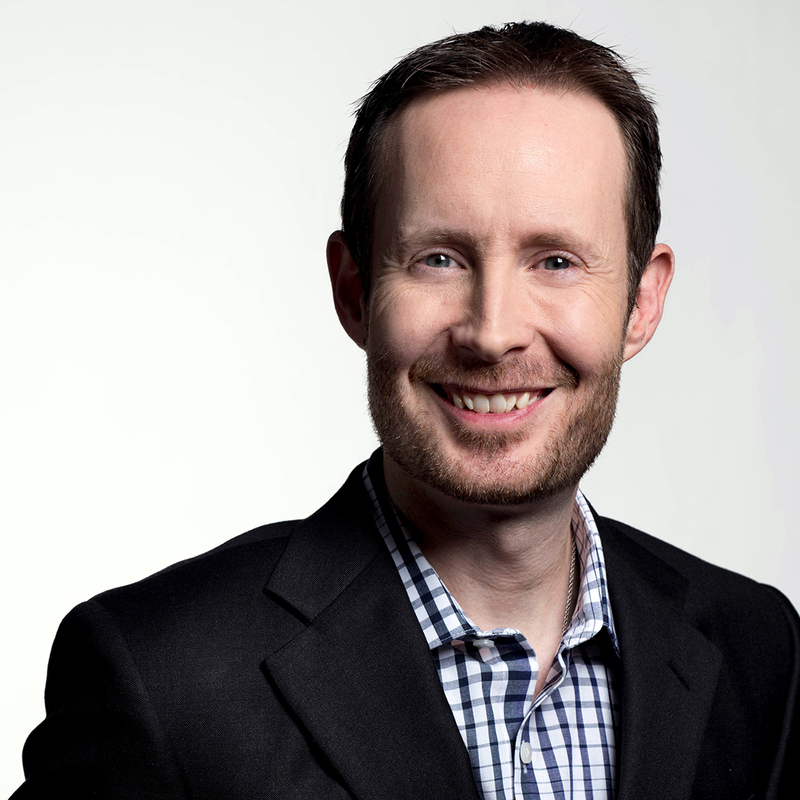 Dr. Stephen Wendel is the Head of Behavioral Science at Morningstar. He’s the author of the white paper, Easing the Retirement Crisis: How Financial Planning and Personalized Advice Can Head Off Extreme Austerity, and he’s also the presenter of a TEDx talk called Turning Intention Into Action. Today on Your Money, Your Wealth®, Dr. Wendel shares 9 ways to make ourselves do things that he and his team have scientifically proven will improve our financial future. Plus, we’ll take a quick look at how companies helped get out the vote for the midterm elections, and some market movers and shakers. And of course, Joe and Big Al answer your money questions: can you contribute the max to both a Roth and a traditional IRA and convert in the same year? Will the pro-rata tax rule apply on your rollover from an old 401(k) with after-tax money to a Roth? And if you’re living comfortably within your means in retirement, is it wise to be investing? I’m producer Andi Last, and here with me are Dr. Stephen Wendel from Morningstar, Joe Anderson, CFP®, and Big Al Clopine, CPA. JA: Dr. Wendel, welcome to the show. SW: Thanks so much for having me. JA: Hey, can you just give a brief background on yourself? What got you to where you are today? SW: Absolutely. So complete happenstance, my research is actually, so I started as a political scientist. I did experimental work studying political behavior in the field, and I had an in-successful business model, to be quite honest; had to shut down my company and join a finance company. And in so doing, actually, I got into the wonderful world of behavioral finance. So it’s actually the same types of techniques, but I came from the political world. JA: Got it. So looking at behavioral finance, there are a lot more studies I think that we’ve seen over the past couple of years that we’re seeing that that is probably one of the most important drivers of returns is the people’s discipline to be able to either stay the course or to understand what’s going on in the overall markets and not freak out. I mean, it’s pretty much as simple as that. But it has a huge impact of the success or failure of their overall retirement. SW: Yes, that’s exactly right. That’s exactly right. We call that The Behavior Gap – the gap between what one could have if you had just bought, did dollar cost averaging and bought in the beginning and held on, versus what actually happens. And so for so many people, they’re not realizing the promise of their investments and they’re not building their wealth and participating in the economy the way they should. JA: I want to go in a couple of different directions with this because I’m a big fan of behavioral finance. I like the different biases because I think it’s so true to everyone. We’re just emotional creatures and we’re probably not equipped to handle money, at least our own money because we’re twice as fearful to lose a dollar than we are to gain, recency bias as we’ve seen recently, no pun intended. We’ve had a nice big bull run in the U.S. stock market. Now we have a little bit of volatility and people now are finally kind of waking up a little bit and getting freaked out, which I think is extremely healthy. We have to get these jolts, but hopefully with the education that you could provide, what should people be doing now that the markets are a little bit more volatile? And we are behavioral emotional creatures. What are some quick tidbits maybe that you can share of helping us with our behavior? SW: Sure. So, in the end, you’re exactly right. We are emotional creatures, we’re all imperfect in so many different ways. And you know, I study behavioral finance because it helps me understand why I screw up so much. We’re all like this. And so I think of the things you can do, really, in two different areas. One is, how do you prepare yourself for that moment? How do you, for example, before the volatility hits, you go through some simulations, see what it would be like? OK, well if you lost half your money, what are you going to do? And so your mind is starting to prepare for that. OK, we’re already there. So what do we do now? Well, now is when you look back and say, “Why am I investing? What is it that I care about in my life? Why do I do this? Is it just to make more money?” For some people, yes, and that’s fine. But for many, it’s really about, “it’s my family, it’s it’s my role in society, it’s the legacy I want to leave.” And when you connect back with that deeper purpose – has any of that changed? Probably not. There is a lot of noise out there in the markets, fine. But that deeper purpose hasn’t changed. And so it allows you to bring back something that’s more stable and use that to help drive your actions. JA: You wrote a paper recently about some different drivers and handles that you can kind of pull, and Al and I talk about these quite a bit. It’s amazing how just maybe one or two levers that you pull can add, what, we’ve seen anywhere from three to 15 years of additional retirement income. Talk to me about the eight different drivers. I know you’ve probably talked about this paper quite a bit, so I don’t want to bore you, but it is a really good paper by the way And then we could get into a little bit of your TED talk because I thought that was pretty awesome as well. SW: Cool, yeah. So in the paper, what we did, we said, “what really matters? What really matters not just for a single investor but let’s look across American society.” And we developed a rather complicated and nice simulation model where we looked at, for example, what would happen if people contributed more for their future? What would happen if they magically had 3% more alpha after fees, etc.? And we looked at eight of these different levers. Areas asset allocation, areas of when you’re going to retire etc. And what we find is that, for most Americans, what really matters are the basics. Are you investing at all? Not necessarily the details of what you’re investing in and exactly whether you’re getting a 7.1% return or a 7.2% return, but rather, are you investing? How much are you saving for the future? And what is your expectation of that future? Because you can get the best returns in the world and if your expectations are outstripping those, doesn’t matter. And you’ll be angry at your advisor, you’ll be angry at yourself. And so we look at those: What are your expectations? What standard of living? Are you investing? And how much? Are you actually saving properly for the future? Those are the big drivers for most Americans, and it’s a huge impact. We can really help Americans be prepared for a comfortable retirement if we focus on these issues. AC: And so I think a lot of us know we need to save more, but sometimes actually knowing that and doing that, that’s a whole different thing. So how can you help us get across this issue, I guess? SW: Exactly, exactly. So even as I say it, I’m like, (laughs) “oh, as a behavioral scientist, I know that this is not enough.” So the things that we look at are how can you make the future more real? There’s great research by Hal Herschfield at UCLA for example, of age-progressing your face, and let me tell you if you’ve never done that before, it’ll freak you out. And it and it helps you see, “Wow, okay, that person, that future, that’s actually me,” and the research has shown that can help people contribute more. AC: I’m already seeing that since I’m now older. (laughs) I don’t have to imagine. SW: (laughs) Okay, for other folks. Another way – let’s put that one aside. (laughs) For other folks, you can visualize that future. Give it more detail, give it more power. Where will you be when you’re 70? What are you gonna be doing at three o’clock in the afternoon? What’s your family saying, how are you interacting with them? The more vividness and texture you can provide to that, the less it’s this vague abstract thing. So those are how you focus on the future. There are also ways to say, “eh, the future’s always vague. Let’s focus on the present. Let’s focus, for example, on wow, those other folks they’re saving a lot more than me. I got to keep up with them.” Use our competitive desire to your advantage. Use that in a healthy way that says, “wow, they’re doing it. Yeah, okay. I should be able to do this too.” And also, where possible, just remove the work. Look for ways where you can automate that process. Now, for many people, they are already automatically saving into their 401(k). Excellent. But are you doing the same thing for your other investments? Do you, for example, set up a payroll deduction so the money goes automatically from your paycheck into a brokerage account? If you have excess money beyond your daily expenses. Those are big things you can do to help prepare for the future. JA: Yeah, without question. I think that extra step of savings, Al and I’ve seen thousands and thousands of individuals, and we would say most of their wealth is in their 401(k) plan because they were able to find some sort of discipline. They checked a box and it came directly from their paycheck. But then that to take it to that next level, to put money into a brokerage account or start a Roth IRA, for instance. We see very little balances in those accounts, but we can see a couple of million bucks in their retirement account. So if they were able to educate themselves maybe a little bit more, to get a little bit more diversification along the way and still save the same amount of money, I think they would be a little bit better off – but then it’s more work, right? Then I gotta open up an account. I gotta do some research, and then they feel like a brokerage account and their 401(k) is totally different. It’s like, “well I’m not very comfortable with investments.” I’m like, “well, you have investments.” No, that’s my 401(k).” Well no, those are investments, right? SW: Exactly. And to me I look at – education only gets us so far. Making it easier. Wow, that gets us a whole lot farther, because it is work! And so how can we make that process less stress, less work for an individual, right? And, like a payroll deduction, if your company supports that, it can be the same amount of work as signing up for your 401(k). And especially if you have an advisor, you have a financial planner who can take care of all the details after that, then there’s some great good you can do there. For more on making good investments, Joe and Big Al are taking you to INVESTOR BOOT CAMP and getting your investments in shape this week on Your Money, Your Wealth® TV – watch it at YourMoneyYourWealth.com and subscribe for new episodes every Sunday. While you’re there, click the Special Offer button to get yourself a free copy of Larry Swedroe’s book “ Think, Act and Invest Like Warren Buffett” with a foreword written by Joe and Big Al. Again, all you’ve gotta do is click that Special Offer button at YourMoneyYourWealth.com. AC: I’m just kind of thinking about our stock market right now, which is more volatile than it has been. I think a lot of us, if we’ve been around a little while, we’ve kind of learned maybe long-term investing, gradual investing, automatic investments – long-term investing is the way to go, yet, particularly as you get closer to retirement, then you’ve got this nest egg. And you know the answer is to kind of ride through it, have the right investment allocation, but yet your emotions can completely take over, and you can make some pretty poor decisions at that point. Any tips on folks that are feeling that way right now? AC: (laughs) That’s my rule today! JA: (laughs) Today that’s my rule and you know what, tomorrow I’m going to have a different rule. AC: (laughs) Yeah I’m gonna change it tomorrow I’m pretty sure. SW: (laughs) Very nice. Yes, it’s best if you do this beforehand. But yeah, you’d have to give yourself a little latitude if you’re doing it in the middle. You’re exactly right. The other thing you can do, for example, is to set a promise with yourself or with your advisor, financial planner, to say, “All right we’re going to do any action – after three days.” Any action, as long as there’s some friction, there’s some additional work. I’ve got to fill out this form, I’ve got to bring in my spouse, et cetera. Again, the goal is to slow it down, to bring it out of the gut and give the deliberative, conscious mind some time to think through this a bit more. JA: All the views. Yeah, Andi Last here. AL: Yeah, I wanted to ask you about the CREATE funnel – this is the funnel to create action. And there are so many steps, it really makes it quite a leaky funnel doesn’t it? SW: Yeah it does, it does. So it’s one of the beautiful things of human nature that when we look at other people and we say, “why don’t they exercise? Why don’t they save for retirement?” We immediately think, “man, they’re just idiots! What’s wrong with them?” But then when we think about our own behavior, we realize, “well, I was busy taking care of my kids, I couldn’t do that.” Or, “you know, I had this report. That’s why I couldn’t go and sign up for the 401(k).” And what that funnel is, it’s a way of writing down all the ways that we ourselves fail, and applying that to everybody. Saying, “Yeah OK, well, people forget. They procrastinate. They may not be paying attention. And so the CREATE funnel is really a summary of the research on what’s required for someone to take action in the moment. You have to have their attention. They can’t have a negative reaction. Etcetera. AL: And so from that, how do we then combat all of those obstacles that get in our way to be able to do those eight things that make a difference when it comes to easing the retirement crisis? SW: Sure, sure. So I find a lot of the power is just in thinking about our imperfections in this structured way. So I actually use that funnel as a checklist on my own team. Look, I study this stuff. I spent a decade working on this, and I still need a checklist too. And that checklist says, “OK well, huh. So I’m trying to figure out why I’m not doing something or why somebody else isn’t doing something. Did I think about attention? Did I think about emotion? Did I think about how we don’t do math well? That’s the Evaluate stage. Did I think about procrastination? And that helps me narrow in on, “OK, here’s what the problem probably is.” Once you have a sense of that problem, often there are some obvious solutions. If the problem is attention, like I keep on focusing on other things, like watching Netflix, playing with my kids, whatever… I’m gonna give real examples, sorry- if that’s the problem, well, what do I need? Okay, maybe I just need a calendar reminder, that, on this time every month, I’m going to review my asset allocation and I’m never going to touch it any other time. Often the solutions are obvious once you have a behavioral mindset. Once you think about the imperfections and the shortcuts that our minds take, that helps a lot. And then yes, actually, if there isn’t an obvious answer, we have a tremendous toolset in the behavioral universe on how to deal with procrastination, how to deal with temptation, how to deal with all of these things. But most people don’t need to be behavioralists, once you’ve got this mindset, you usually can figure it out. AL: Now the fourth step on there is ability. That’s an important part. And would you say that’s where a financial planner may come in? Because a lot of people are going to think, “I don’t have the ability to make these decisions and figure out what is the best thing to do for myself”? SW: Exactly. And you’ve got the most important aspect of it, right there in the question, is, when we talk about ability, there are two parts. One is the obvious thing. Do you have the password to the site where you gotta to go sign up for this stuff, right? Fine. And that’s what so many people focus on. But you got the important part. Do I think I’ll succeed? Do I feel that I know that I can? Do I feel like I can actually do this? And yeah, sometimes that takes another person helping you see that it is possible. Helping you say, “look, we’re gonna do, this we’re gonna make this happen. You’re not in it alone.” And that could be tremendously valuable. So yeah, that’s the self-efficacy part. The sense of ability that you were talking about. Absolutely. JA: We’re talking to Dr. Stephen Wendel from Morningstar. Hey, where can people get more information about you, the work that you’re doing, the articles that you’re writing, and everything else in between? SW: Sure. So at Morningstar, we have a great project called The Investor Success Project that focuses on exactly the issues we’ve been talking about today. We have new research come out every month about easing the retirement crisis, about particular topics like 529, etc. All you have to do is put “Investor Success” in Google, we’re the top result. JA: Investor Success in Google, and then there ya go, you get some articles by the good doctor. Awesome. SW: Lots of great research there from my team and from many others at Morningstar on these topics. JA: I really appreciate your time, I know you’re a busy guy, and this was really fantastic. SW: Hey, thanks so much for having me. It’s been fun. To watch the video of this interview, or for the full transcript and links to Dr. Wendel’s paper, Easing the Retirement Crisis, his TEDx talk, Turning Intention Into Action, and to Morningstar’s Investor Success Project, check out the podcast show notes at YourMoneyYourWealth.com. You’ll also find a simple recap of the 9 things Dr. Wendel suggests that can help you improve your retirement. Go through simulations – what would I do in times of volatility? Now it’s time to bust open the email inbox and answer your money questions. If you’ve got a money question or a comment or suggestion for the show, we’ve got options for you: You can you can email info@purefinancial.com, you can click the “Ask Joe & Big Al” button at YourMoneyYourWealth.com, you can call (888) 994-6257, or you can post your question on our Facebook or Twitter pages and the fellas will answer on the podcast. Find our social links in the show notes at YourMoneyYourWeatlh.com! 19:20 – Can I Contribute the Max to Both My IRA and Roth IRA, Then Convert in the Same Year? JA: We got Lenny from Michigan. “Hello, my name is Lenny. Do you have a penny?” Anyone remember that? JA: Really? Good Times. Remember? The guy would open up his jacket and then he would have TVs and watches? AC: (laughs) I’m sure you’re right. AL: I didn’t watch it, sorry. AC: Yeah I remember J.J. but I probably watched that show for like two minutes. JA: Janet Jackson was on the show. I loved Good Times. And I believe it was in the projects of Detroit. So maybe this is Lenny from Good Times. AC: It’s a great idea. The answer is no, you cannot do that. You can mix or match. The combination of the Roth and the regular IRA can be no more than $5,500 unless you’re 50 and older, then it’s $6,500. JA: Yeah. And if you want to do IRA, Roth IRA, you can do both, but the maximum is $5,500. So you could split it up, you could say $1,000 into the Roth, you can put $4,500 bucks into the regular IRA, vice versa, whatever but it’s only $5,500. AC: Here’s what you can do though, it’s November right now as we’re recording this, so go ahead and do your contribution for 2018 and in January do your contribution for 2019, so you can really double up in a short period of time. JA: Yeah, but he’s still wanting to probably do that every single year to get the $11,000 bucks is probably what he’s thinking. AC: I understand it but this is a way to fast track. JA: Yeah. Lenny if you’ve got a 401(k) plan, that’s where you would convert the 401(k) into your Roth. So you can have a Roth IRA and a 401(k) plan, it’s not one or the other like here. So you could put in the $18,500 into your 401(k) plan, still $5,500 into the Roth, and if you want to convert some of the money from the 401(k) plan and move it into the Roth IRA, you can legally by law, but then you have to look at your plan document to see if you can get money out of that 401(k). AC: Yeah. And if your 401(k) has a Roth option, you can just do that do it that way. So you get $18,500 in a Roth 401(k) and another $5,500 in a Roth IRA. JA: So there you go Lenny, hopefully, that helps. 22:03 – I Have Traditional 401(k), Traditional IRA and After-Tax IRA Assets. If I Roll 401(k) to Roth Will Pro-Rata Tax Rule Apply? JA: Now we got Lenny’s neighbor Kip from the D – Detroit. “Great podcast. This is Kip from Detroit, Michigan. I have a mixture of traditional 401(k)s at an old employer,” he’s got a traditional IRA and after-tax IRA assets. “If I roll my 401(k) directly to a Roth IRA, will the pro-rata tax rule apply to my after-tax IRA assets? Thanks, guys.” I gotta probably re-read that. AC: (laughs) That’s a little tricky. JA: OK let’s just break this thing down. So he’s got a mixture of traditional 401(k)s – so he’s got an old employer 401(k), so that money is at a 401(k), old employer, dormant plan. He’s got traditional IRA and after-tax IRA assets. AC: And it could be in a single account. JA: So let’s just assume he’s got the traditional IRA that has after-tax basis within that IRA. So if he rolls his 401(k) directly to a Roth IRA, “will the pro-rata tax rule apply to my after-tax IRA assets?” No. AC: Correct. It does not. JA: Because it’s now going into a 401(k), directly into the Roth IRA. You’re going to pay tax 100% of that 401(k) balance. So Kip, you might take a little bit of a step back here. I would first want to know what is the after-tax component of the IRA. How much money is after-tax, how much money is pre-tax? And then you might take a look at that and try to get that IRA converted first because the pro-rata rule only applies to IRA assets. It doesn’t apply to that old 401(k). AC: Right. And here’s a thought I had, which is if you have a current 401(k) right now – I can’t hardly talk – if it will allow you to roll your IRA into the 401(k), but it does not allow after-tax money. So you do the pre-tax many in the 401(k), you’re left with an IRA with basis only, then you can convert that and pay no tax whatsoever. AC: That’s true if it’s an old employer. JA: So then I guess then if he’s got another 401(k) plan, take that new 401(k) plan and try to do it there. So I guess we kind of convoluted the hell out of that didn’t we Big Al? AC: (laughs) We did. But basically, the correct answer is, if you’re going right from your old 401(k) to a Roth, it’s all taxable. You don’t get any pro-rata benefits. 24:44 – I Live Comfortably Within My Means in Retirement. Is It Wise for Me to Invest? JA: Last but not least this is a pretty quick easy question for Karen in San Diego. She’s 65 in a few months. She owns an income property, she owns a mobile home which is her primary residence, she is fortunate to have a pension and Social Security and military health insurance. Other than a small mortgage on her income property she has zero debt. She’s got about $30,000 in savings. “My question, since I’m living very comfortably within my means, is it wise for me to invest anything?” The answer is no. AC: The answer is no. JA: Sit back relax and enjoy the ride. AC: That is your emergency savings, and good enough. Videos of all three of today’s email questions and answers are in today’s podcast show notes at YourMoneyYourWealth.com. Send us your question, comment or suggestion and maybe we’ll make a video for you, too! Email info@purefinancial.com, click the “Ask Joe & Big Al” button at YourMoneyYourWealth.com, call (888) 994-6257, or post your question on our Facebook or Twitter pages. However you want to do it, the fellas will get you an answer. I can’t guarantee it’ll be a good one, but it might be pretty entertaining. Unlike this next segment. JA: This week was interesting, Alan. We had midterm elections. The market was favorable to the outcomes. AC: It seemed to like the House going Democratic and then the Senate retained Republican. JA: So yeah we’ve seen a lot of volatility, but it looks like the markets have almost reached back to highs over the last couple of weeks, anyway. AC: Right yeah, this week was pretty good. JA: You know there are some interesting stats that happened. Because people wanted to get everyone out there and vote. And you voted? JA: Congratulations. Thank you for doing your part. AC: And you did too. JA: Yes I did. Andi, did you vote? AL: Absolutely. Actually, I voted by mail, so I voted like in October. AC: Yeah, I voted by mail too, but I dropped it off on the Monday before. JA: Have you heard of Pizza to the Polls? AC: No I’ve not heard that. JA: They delivered 10000 pizzas to hungry voters that were waiting in lines. AC: Really? To get people to vote. JA: Yeah, you hungry, you’re sittin’ in line, here’s some pizza. 10,000 – or 10,005 to be exact. AC: (laughs) They couldn’t really round it off, 10,005 pizza pies. JA: And then companies also got involved. They spent some money here to get some voters out there. Snap added polling stations to Snapchat maps. AC: Oh, so you know where to go. JA: Yeah. Spotify reminded users to vote by offering custom local playlists. If you vote you get your own special playlist. Uber, Lyft and Lime – have you ever heard of Lime? AL: They’ve got scooters and stuff, right? JA: All they do is just litter the hell out of downtown San Diego, I tell you that. AC: I know, I’m aware of that. JA: They offered discounted/free rides to the polling station. Tyson Foods held a company-wide voting initiative that led to at least 60 employees registering to vote. That was good. Okay, whatever. Levi Strauss, what the heck do you think they did? JA: They gave workers the whole day as past time off. You know, if you need some time to go vote? AC: As paid time off, or passed time off? JA: Paid time off. What did I say? JA: Wow, banned. You cannot use your phone. We’re shutting it down. AC: Yeah right. What do you mean by that, Andi? JA: They were gettin’ deep! We were just getting deep! I guess what really won the whole thing was pot stocks. AC: Pot and insurance stocks. JA: A lot of states now are saying, hey you know, it’s pretty good. It’s OK. Wake up like, all right! JA: “What are you smoking?” Well, Michigan legalized recreational weed. Missouri, Utah, approved the medicine. So if you do medicinal. It’s now legal in 10 states and D.C. and 33 states have, like, decriminalized. So they’re not spending all of the workforce of our police and FBI to hunt down little Johnny smoking a weed. Smoking a joint. AC: I think that’s a good idea actually, myself. AL: Do you want me to read this for you? AC: They’re actually going to be the first and only company that will design its own two-wheeled people movers and I’m not sure if that means they’re going to be designing bicycles or what, but they actually have hired the Apple guy Liam O’Connor to do the hardware and software. AL: They are breaking their legs and stuff, I think. IJA: Right? I’m not going to go on one of those things. And then there’s the one that you could sit down on, did you see those? JA: It’s kind of like a motorcycle. It’s the layout of a scooter, but then there is like a seat on it. AL: All right so let me ask, what do you call it Vespa. Isn’t that a scooter? Scooter is such a confusing word. AC: You have to look it up because I have no idea. JA: Yes, I remember scooter that actually you would pedal it to start it, and then you would stop pedaling and then it would keep going. AL: I actually like this one, on the 5th the stock market winner was Molson-Coors, Joe’s favorite, Coors Light. Their profits went up but 30%. But they’re more into the fact that they have growing plans to launch pot-concocted CBD-infused drinks. So there’s gonna be the weed Coors, I guess. AC: When the Mountain is Green you can drink it. Well, that’s all good news. JA: Good job news and bad news for stocks. The Federal Reserve loves two things, low unemployment, and low inflation. Since unemployment is at its tiniest point in decades, the focus is on inflation. So the report makes it more likely the Fed will increase interest rates again to slow the economy keeping inflation in check. It could potentially hurt stock prices. JA: Average wages grew by almost a buck to $27.30 which is 3.1% up from last year. So it’s a real pay increase. AC: It’s that raise you got to tip the scale. JA: It was, thank you for that. AL: Ohh, I just remembered that means it’s time to talk to my boss. AL: He already got the raise, there is no more. AC: We should look at it before we read it. (laughs) That would be helpful. AC: I’m going to groom it a little more for you guys. AC: Well it’s fine. We just have to read it first. AL: Hey, I’m willing to help whenever you need it. JA: All right, we’ll see again next week, for Big Al Clopine, Andi Last, I’m Joe Anderson, the show is called Your Money, Your Wealth®. Special thanks to today’s guest, Dr. Stephen Wendel, Head of Behavioral Science at Morningstar. You’ll find links to Dr. Wendel’s paper, Easing the Retirement Crisis, his TEDx talk, Turning Intention Into Action, and to Morningstar’s Investor Success Project in the podcast show notes at YourMoneyYourWealth.com. Those show notes also include links to subscribe to the podcast on all your favorite apps, including Google Podcasts and Apple Podcasts. We’re also on Spotify, Stitcher, Overcast, Player.FM, iHeartRadio, TuneIn, and now you can listen to the Your Money, Your Wealth® podcast on YouTube as well!